Safety is of utmost importance to Autogas. Here is a brief look at the many safety features a typical system includes. Click on a number for more information. Stako tanks - Crash Tested and with the following approvals and certifications, ECE R67.01 UN, ECE R110 UN, ASME, GOST, Australian, Standard 3509, Indian Standard 14899, Korean Standard, 9723/EC, 99/36/EC. Approved. Antileak pressure resistant shut off valve. Manual supply shut off valve. LPG capacity controller full up to 80% to leave room for expansion. Mechanical magnetised LPG level meter. Electronics supply cut off valve to switch off LPG supply when engine is off and ignition is on. Electronic supply cut off valve in full flow circumstances (e.g. pipe failure). HANA injectors have many merits such as low noise, heat-resistance and the function of selection each cylinder fuel quantity. Hana injectors have much more less variation of fuel quantity and much longer lasting use. Approved ECE R67, ECE R110 and Australian certified. Latest technology, OBD connection for a continuous gas trim calibration, fully programmable and mappable. Controls exact amount of fuel supply and controls LPG supply electro valves. Switch with fuel level indicator. Steel pressure resistant LPG filter. Measures manifold pressure and send information to ECU. 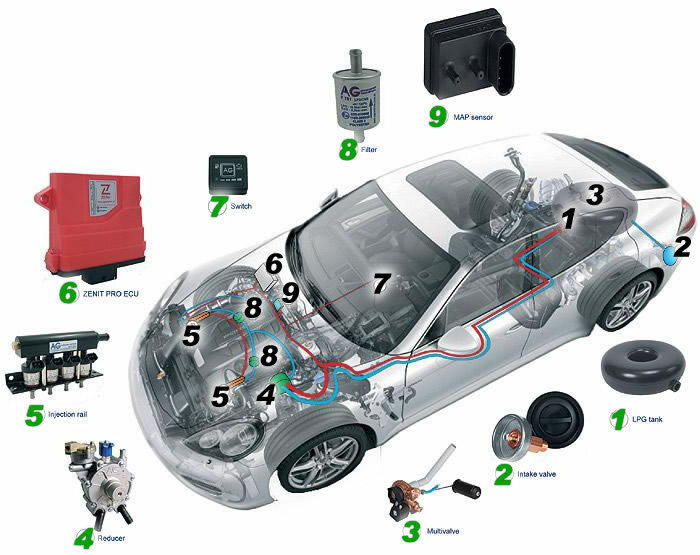 Extra Tasks in vehicle service - Leak Test and LPG Filter no. 9 replacement.